As we provide a great range of high quality steel pallets, we have designed and developed highly durable collapsible pallet. We offer cost effective range of the collapsible pallets. We make use of high grade material to fabricate these pallets. Base of the pallets is made of the MS tubular structure. Sides of pallets are made from wire of different mesh sizes. These pallets are arranged one on one, which save the space in storage. With world class manufacturing facilities, we provide various coating for the collapsible pallets. 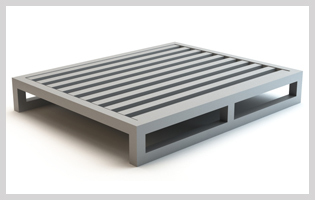 Commonly powder coated pallets are preferable for the applications. These pallets find their applications in automobile sectors. It is also widely used in various industrial warehouses.